Offering over 17,000 items from its product portfolio and operating from eight strategically located distribution centres, Spicers is one of the UK’s largest wholesale providers of stationery and office supplies. Following acquisition by venture capitalist firm Better Capital, Spicers wanted to improve efficiency and reduce cost in its MHE fleet – and after an extensive tendering process chose a fleet of new Crown equipment, all fitted with the innovative InfoLink® fleet management system. With a turnover in excess of £330M, Spicers is supplying office products to a network of authorised dealers across the UK, supporting them through a market leading e-commerce solution. All products come in from manufacturers to Spicers’ Central Distribution Centre (CDC) at Sawston, Cambridgeshire. The CDC then replenishes goods stocked at the six Regional Distribution Centres (RDCs) on a daily basis, which in turn provide a same or next day service to office products dealers in their geographic area. Finally a Dealer Distribution Centre (DDC) in Smethwick, West Midlands provides a service whereby products are picked, wrapped and dispatched on behalf of dealers and sent directly to their customers. The new fleet of Crown equipment, acquired on a contract hire basis, has already made a significant improvement to the operational efficiency at Spicers. “We owned our previous fleet of materials handling equipment. Due to age, a lot of the equipment had become very expensive to maintain,” explained Spicers’ Operations Improvement Manager, Bobby Arman. “We embarked on a tendering process for new equipment to be acquired on a contract hire basis. We are not truck people – we needed professional advice to get the correct fleet for our business and this is where Crown shone. Working with Crown’s National Account Manager, Steve Rumbelow, we assessed the operational activities across our eight sites and quickly realised that through better utilisation of our MHE fleet, huge efficiency savings could be made. This would bring an immediate and dramatic reduction to our running costs as well as reducing the number of units we required. For Spicers, cost of maintenance and repairing damaged trucks had become hugely expensive as their fleet became older. Steve Rumbelow explained: “When we initially looked at the Spicers’ fleet, in many cases they had more than one truck on site to ensure availability when they had a breakdown. Spicers’ CDC at Sawston receives products direct from manufacturers and operates a mixed fleet of Crown equipment including WP 3000 and WT 3000 powered pallet trucks for loading and unloading, GPC 3000 low-level order pickers for bulk picking and the ESR 5000 reach truck. 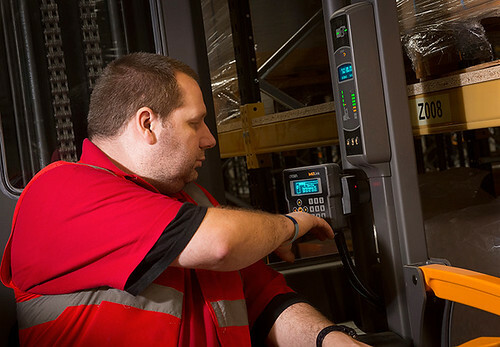 The ESR 5000 Reach Truck Series has given Spicers’ operators a distinct performance advantage: class- leading ergonomics, superb visibility and application flexibility allow operators to work faster and more comfortably without compromising safety. In its Greenwich RDC, Spicers have adopted a fleet of Crown TSP 6000 VNA trucks. Featuring the MonoLift™ mast, the TSP Series reaches lift heights at faster speeds (up to 0.61 metres/second), enabling Spicers to gain maximum benefit from every pallet location. Spicers’ operators are also noticing the benefits of the new equipment. Within the operators cabin, Crown’s MoveControl™ seat features integrated armrest controls for shift-long support and four seating positions for unsurpassed visibility and comfort while maintaining safety with precision control of all truck functions. Safety-first floor presence pedals require the operator’s feet to be in place before the truck can commence work – there’s even a microcellular anti-fatigue floor mat to reduce the risk of discomfort and back stresses. Multiple compartments provide convenient storage for documents, tools and other operator needs. During picking operations, postural support for the operator is provided by a work-assist rail and side gates. The Intelligent Braking System (IBS) automatically adjusts braking force to allow for lift height and other key variables to give better control and minimal mast sway. An additional fleet of TSP 7000 VNA trucks with a lift height to 17 metres has been delivered into the Smethwick DDC. 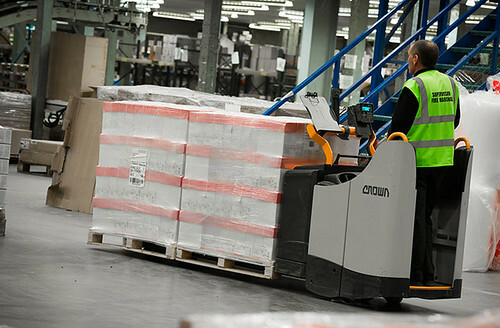 The Crown WP 3000 pallet truck features in all sites. Dubbed the “workhorse of the warehouse”, the WP pallet truck combines power and performance with manoeuvrability and ease of operation and is at home whether unloading from the back of a lorry or moving loads across the dock. Spicers also use the WP for order picking in the RDCs. As well as the health and safety benefits, Spicers has also experienced a significant improvement in driver productivity and a reduction in damage and operating costs. Crown Equipment Corporation is one of the world’s largest material handling companies. 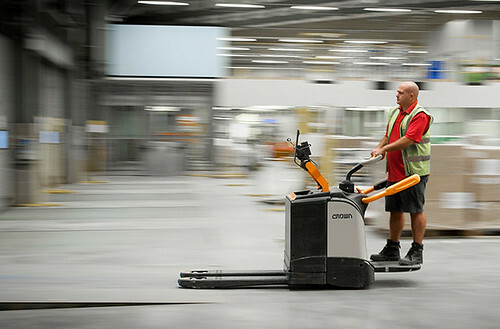 Crown’s award-winning line of forklifts maintains a reputation for advanced product design, engineering and integrated manufacturing processes. 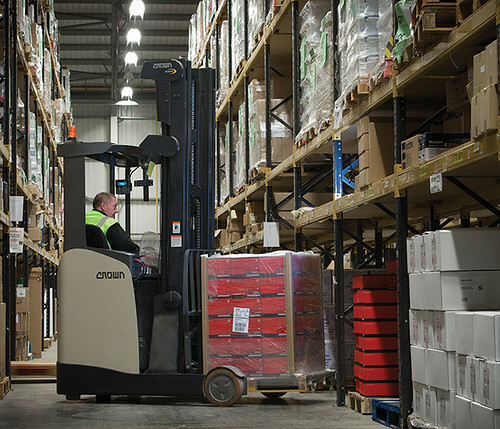 Offering a broad range of forklifts, as well as automation and fleet management technologies, Crown provides customers with forward thinking and innovative products designed to improve performance and lower operating costs. With its Head Office in New Bremen, Ohio, and regional headquarters in Germany, Australia, China and Singapore, Crown operates a global service and distribution network. Additional information about Crown’s ideas for helping its customers advance the productivity of their operations and accomplish more can be found at www.crown.com.